Newbery Medal–winning author Avi has selected short stories from the past and present in this entertaining collection for young readers. And whether you begin by reading alone or reading aloud, these stories are some of the very best to share. Featuring loyal pets, rogue waves, ghosts who use cell phones, and young people caught up in events beyond their control, these stories are written by some of the most entertaining and esteemed authors of children’s literature. They will have you savoring a quiet moment by yourself, talking during dinnertime with your family, and laughing in class with your friends. 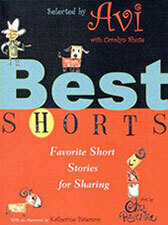 Though it may take only a few minutes to read, a terrific short story can take you on a long journey. Are you ready for the trip?